Tekst Unique. A Nazgul's prowess is modified by +1. If used with the Witch-king of Angmar, his prowess is increased by +1 plus the number of Nazgul permanent-events in play. Discard if attack doesn't wound a character. Corruption. 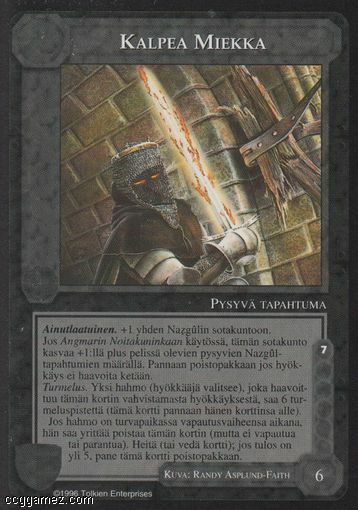 One character (attacker's choice) wounded by an attack modified by this card receives 6 corruption points (place this card under the character). If at a Haven [H] during his untap phase, a character with this card may attempt to remove it instead of untapping or healing. Make a roll (or draw a #): if this result is greater than 5, discard this card. Cannot be duplicated on a given Nazgul.